Union railway minister Dinesh Trivedi on Thursday sent his resignation letter to Prime Minister Manmohan Singh, according to TV reports. 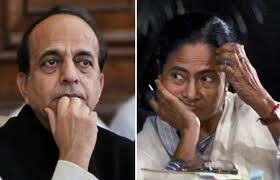 The PM is likely to accept Trinamool Congress chief Mamata Banerjee's demand to sack Trivedi. Trivedi came under fire from his own party Trinamool Congress for hiking the fares in the 2012-13 railway budget that he presented on Wednesday. Trinamool Congress chief Banerjee and party leaders trashed the budget, demanding rolling back of hikes in passenger fares. Banerjee sent a letter to the prime minister asking him to remove Trivedi and suggested Mukul Roy's name for the railway minister post as per report. A US-educated Trivedi, 61, found himself in a piquant situation immediately after he presented his maiden Railway budget in which he proposed an across-the-board hike in passenger fares to mop up an additional Rs.4,000 crore for spending on railway safety. On a cue from TMC boss, Mamata Banerjee, chief minister of West Bengal, party MPs attacked the hike and demanded a roll back in keeping with her populist politics which has resulted in repeated trouble for the UPA government over issues such as FDI in retail and petrol price hike. Banerjee followed up with a public declaration that she will not not allow the fare hike. She complained she had not not been consulted by Trivedi, which he confirmed.